1. Between two sequence points, an object is modified more than once, or is modified and the prior value is read other than to determine the value to be stored. 2. 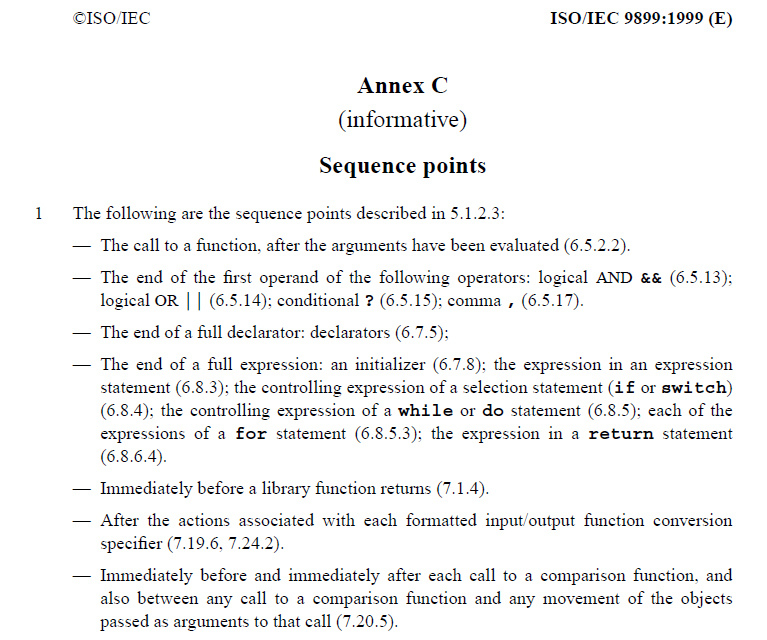 An attempt is made to modify the result of a function call, a conditional operator, an assignment operator, or a comma operator, or to access it after the next sequence point. Possible undefined behavior ranges from ignoring the situation completely with unpredictable results, to behaving during translation or program execution in a documented manner characteristic of the environment (with or without the issuance of a diagnostic message), to terminating a translation or execution (with the issuance of a diagnostic message). undefined: Anything at all can happen; the Standard imposes no requirements. The program may fail to compile, or it may execute incorrectly (either crashing or silently generating incorrect results), or it may fortuitously do exactly what the programmer intended.